What has happened is a successful rollout. Good sense is even dominating the whole process. Add in the added recent discovery that marijuana just happens to allow hard drug users to wean themselves and in spite of the continued prohibition, there is serious hope that real drug addiction is in serious and sustainable retreat. After all these years, we really needed this news. The momentum and capital investment is also leaping ahead and all this bodes well for a robust industry in which the delivery protocol of choice will be oral in food and through these new vaporizers. Both are medically safe which smoking never is. The real payoff will be the general collapse of criminal activity which has barely begun. The news: Colorado's pot sales are booming. The state's Department of Revenue reports that marijuana retailers sold nearly $19 million in recreational weed in March, up from $14 million in February. The first three months of legal weed have netted about $7.3 million in taxes, not including medical marijuana sales taxes and licenses, which bring the number to $12.6 million. In it's first few months, Colorado could already soon be outpacing those historic first-day sales on a daily basis. Retail marijuana sales taxes brought in $1.4 million in January, $1.43 million in February and now $1.898 million in March — a clear upward trajectory. And total marijuana tax transfers and distributions went from $2.927 million in January to $4.077 million in March. And perhaps more importantly, while it's still somewhat early, the up-trending numbers indicate that initial sales weren't simply the result of "new-toy" excitement wherein everyone was buying pot just because they could. Coloradans wanted marijuana before, and they still do now. (Un)intended consequences: Over the same time period, crime in Denver has slightly declined, making opponents who said it would result in more trafficking seem kind of silly. It's created a modest number of jobs ranging from "budtending" and marijuana journalism to farm labor and ownership. (Weedmaps, a dispensary review site, grossed some $25 million in revenue in 2013.) And the state has even created a banking system that complies with the U.S. treasury system's guidelines, clearing up the last regulatory questions. While certain parts of the rollout, like edible cannabis regulations, have come under question, the law seems to be operating basically as intended. Legal cannabis sales in the United States are projected to reach as high as $2.57 billion this year, split among the 21 states that allow the sale of some form of marijuana. That's up from $1.53 billion a year ago. As time goes on, the marijuana industry will grow its own stakeholders and perhaps become a political lobby in its own right. How it'll be spent: The Colorado legislature has already formed a plan to spend $33 million of the marijuana taxes on school nurses and public education on marijuana. Even Colorado cops plan to get a chunk of the new revenue, asking for 10-15% of the proceeds for DUI enforcement and fighting diversion to other states and unlicensed sales. 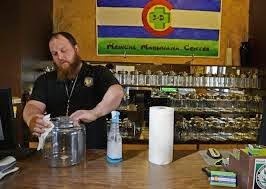 The bulk of sales, however, continue to be in medical marijuana, which has been legal in Colorado since 2000 and recorded $35 million in sales in March. However, since recreational weed is more heavily taxed, it could still rapidly outpace medical marijuana in total tax dollars. In total, Colorado Governor John Hickenlooper projected in February that total Colorado marijuana sales could approach $1 billion. Of course, sales could still slow down. But the news in Colorado is evidence that marijuana legalization can successfully generate value for both the local economy and the government. It is a good idea to have a unique role in presenting the positive and powerful information, and we can review the review of targeted content in life and the blog shows everything.